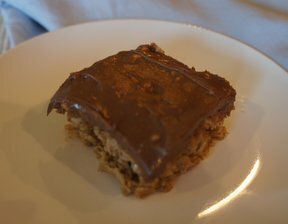 Peanut butter and oatmeal bars are frosted with a creamy peanut butter frosting that melts into the bars. 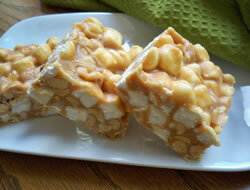 If you love peanut butter, you're sure to love these bars. Cream together the butter, peanut butter and sugars. Add flour, salt, baking powder and oatmeal. Mix well. Spread in 2 greased 9x13" pans. Bake at 325° for 25 minutes. For frosting, cream together peanut butter, powdered sugar and salt. Add milk to desired consistency. 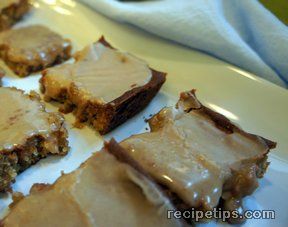 Remove from oven and frost immediately with peanut butter frosting. Let bars cool after frosting before cutting. "I made this and used one 15x17" pan. 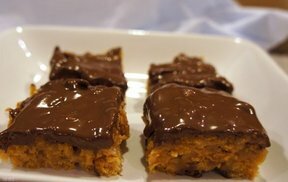 Bars were a little crispy around the edges, but soft and tender in the middle. These were unbelievable warm with the melty frosting!"